There is no dry theologizing in this spirited rebuttal, written in 1974, to defend the clear meaning of the thrice defined dogma: Extra Ecclesiam Nulla Salus (Outside the Church there is No Salvation). What you will read in this exposition is a hearty response, not laced with anything but the truth, as the supreme magisterium has already expounded it, concerning the visible whereabouts of the only means instituted by Jesus Christ for salvation. The doctrinal crusade of Saint Benedict Center dates back to the early 1940s when we began to attack, albeit in their incipient form, the very evils that conservative Catholics are so concerned about now. It was not long before we realized, however, that these troubles afflicting the Church were but symptoms of a much more fundamental one, a deadly heresy responsible for them all. Very few people saw the warning signals at that early stage, for the heresy itself had not taken full form and its fruits had not yet appeared. It became more and more evident what this underlying evil was. 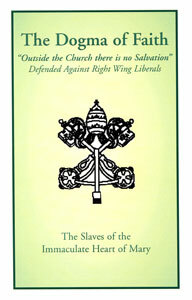 It was the denial of the necessity of belonging to the Catholic Church for salvation. The whole collapse in the Church today can be traced to the silencing or weakening of this one doctrine. Most so-called conservatives are not aware of this fact. We are convinced that they will never win one single victory until they are. Not until this fundamental truth is preached again from every Catholic pulpit shall we see again the triumph of Catholic values and Christian morals. It is only then that we shall see a resurgence of Catholic life — preaching, education, vocations, missions. Only then shall we see the restoration of orthodoxy and tradition, pre-eminently in the restoration of the traditional Mass. 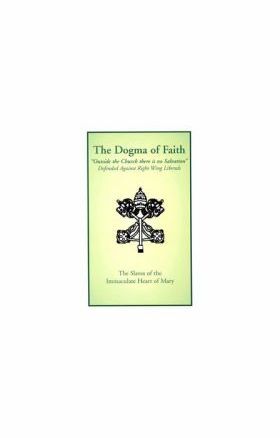 From the start we proclaimed the dogma of Faith: “Outside the Church there is no salvation.” We vowed to defend it. It is our duty not to stop our fight until we have succeeded in rousing the sleeping giant — the Church Militant! Others might observe the effects of the present-day apostasy; it is our vocation to proclaim the cause. There can be no Christian civilization without this most fundamental of all Catholic truths, the belief of innumerable multitudes who have gone before us: Outside the Church there is no salvation. In waging our crusade, even our most determined opponents admit that we have fought courageously and that we have paid the usual price in terms of humiliations and sufferings. Even the most extreme liberals have been willing to grant us the dubious honor of being sincere. We have never sought, we hope, any compensation for our labor on this earth; but we should be able to expect from conservative fellow Catholics, who at the present share most of our worries, the decent consideration due to pioneers in the conservative campaign. We ourselves extend that courtesy to anyone fighting, let it be confusedly, for faith and tradition.